This double-sided form has one side for the parents to report on their child's health and the other side is for the physician's report. These report cards are organized for an individualized school setting and can be used for one semester. Includes a place for a quarterly report on behavioral growth. 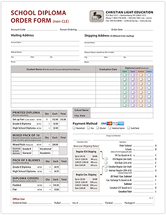 These forms are laid out for a quarter at a time. Includes room for thirteen students on one side of form. Different symbols mean absent, tardy, excused absent, and excused tardy. A chart for display in student's offices on which stars are affixed to keep a record of the tests a student takes along with the subject and week he takes them in. Used by the student to plan his daily work in each subject. Double-sided. These forms are a record of a student's academic performance throughout his twelve years of school. 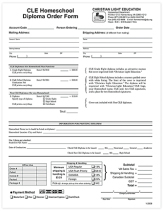 Used as a transcript when student transfers to another school or college. 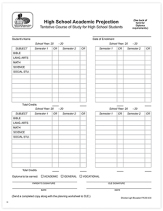 These forms are used to plan a student's courses of study during his four high school years. Includes blocks for each year and a format that makes it easy to figure the amounts of credit he will earn. A form used to record a student's grades and grade averages for the whole year. A teacher usually arranges these in a three-ring binder and uses it as his grade book. 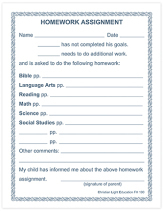 A form for students with homework to take home for parental signature. 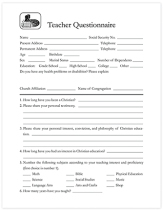 A form for prospective teachers to fill out giving a brief summary of personal data, academic information, and spiritual experience. Includes blanks for three references. Used by homeschoolers to record their student's grades. 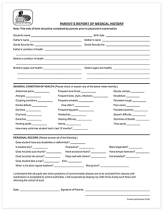 Selected forms needed for one student for one school year. 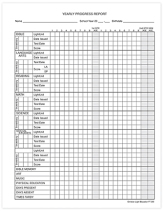 This 4 1/4 X 6 3/4 CLE report card is designed for homeschools. Contains places to record a score for each LightUnit, grade averages, behavioral growth, and attendance. A large manila envelope that goes along with the elementary report card. An envelope for the High School and Homeschool report cards. Sent free upon request. Should be used by schools and homeschools ordering CLE materials.